Owen Ogletree (director of Brewtopia Events) gathered together some of his fellow beer lovers at Athens' Globe Pub to sample and comment on several commercial beers that exhibit big flavor and/or body. 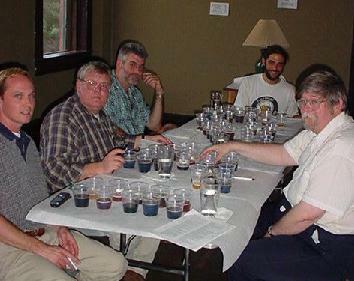 This beer sampling was done as a blind tasting where each style was revealed, but no one was aware of the brand that was being served each time. Beers were informally commented upon and ranked according to American Homebrewers Association (AHA) style guidelines. This sampling was conducted in late September, 2001. First, second, and third places (best of show) were awarded to the beers we felt best represented their styles in extraordinary fashion. It is a shame that only two of these remarkable beers can be sold in Georgia because of the state's outdated alcohol limits on beer -- click on the "Georgians for World Class Beer" link below for more details on this problem. Drop Owen an email to share your comments and opinions. (L to R): Todd Huff, Lari Cowgill, Dean Graves, Matt Buley (brewer for Athens' Burntstone Brewhouse), Johnnie Sutherland, and Owen Ogletree (not pictured). We'd like to thank The Globe for hosting us! A wonderful black ale with an aroma that seems to have more hops than malt. Flavor is of burnt currant, cocoa, coffee, licorice, and vanilla. There is a nice complexity here with a creamy, smooth, and initially sweet (but not cloying) character. There is a hint of dryness in the aftertaste. Roasty with a great balance and full body. An extremely flavorful beer! A very spicy beer with loads of complexity and spicy, sherry-like flavors. This bottle seems to have been well aged. There is a touch of banana in the aroma and flavor and the taste is creamy with moderate carbonation. Reminiscent of whole wheat toast and raisins. Color is cloudy, dark golden. A very warming beer. This lager beer is malty with the definite presence of dark malt. Smooth, and warm. Very rich lager beer with a dark color. Aroma has touches of prune, plum, and raisin. A wonderful, darker version of the style. Aroma is fruity with plums and alcohol. Flavor is intense with toffee and a great mouthfeel. Wow! Color is a nice amber. There is very little hop emphasis here -- the viscous malt comes through strongly -- perhaps making the beer a bit too sweet. There is a smooth warmness from the alcohol. A really delicious English barleywine. Aroma has a citrus-like component and is very fruity. The appearance is golden. Flavor is of clove and apricot. A smooth, drinkable version of the style. Needs a bit more spicy character? Candi sugar is apparent in the flavor. A good example of the Tripel style. This ale is dark amber -- a bit dark for a Belgian Strong Golden Ale. Aroma is very fruity and spicy. Beer is cloudy. Flavor has a bit of clove, fruit, and alcohol. Aftertaste is somewhat dry. This is an interesting beer with lots of alcohol. Aroma is fruity and estery. Appearance is on the light end of color scale for this style. Flavor is of alcohol, caramel, fruit, and spice. It has a medium/full body with notes of butter and butterscotch. It is not a hoppy beer, but a very complex one. Very interesting and unique. May have dark candi sugar. This is a robust porter with oats. Very beautiful, dark color; and aroma is of hops and coffee. Flavor is hoppy, roasty, and tastes like burnt toast with jam. You can taste nice flavor of oats. It tastes a bit more like a Stout because of the roasted character. A rich, nice beer. (This was judged as an English Barleywine with maple syrup.) There is no head and no carbonation. Aroma is very strong with raisin and maple. Flavor is strong with dark chocolate, maple syrup, and licorice. Alcohol burn is intense. It tastes a bit like a dark chocolate covered cherry. There is an earthy quality behind the heavy sweetness. Tastes likes dates and plum. This big beer is out of balance with too much sweetness from the maple syrup. As it warms it tastes a bit like soy sauce. (This beer was judged as a Dry Stout with American NW hops.) Color is jet black. Aroma is of hops, burnt malt, coffee. This is a beer with a big piney, citrusy flavor of American hops -- a very hoppy beer in aroma, bitterness, and flavor. There is a delicious coffee, malty flavor behind the hops, and a very nice medium/full body.